There was an immersive dome experience at the latest VRLA event called Samskara that was based upon the Hindu Vedas produced by 360art. 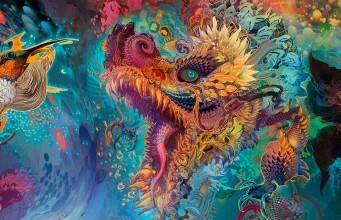 It featured different Hindu mythological characters reimagined by visionary artist Android Jones. I had a chance to talk to Android about the intriguing backstory of this project that involves a mysterious Swami who is experimenting with the latest immersive technologies as a tool for spiritual transformation. Android was also publicly debuting Microdose VR for the first time at VRLA, which is a particle-emitting painting program designed for realtime VJ performances or a tool to get into the creative flow state. 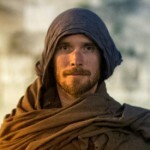 The experience was informed by Android’s many years doing live art performances at transformational festivals, his experiences within the games industry as a digital artist, as well as inspiration from a number of different psychedelic experiences. You move your hands around spray painting particles in Microdose VR with a similar mechanic to Tilt Brush, but rather than drawing 3D vector lines your strokes emit a wide range of different psychedelic molecules that morph, evolve and disappear. There’s no ability to save or undo any of your creations, and so it’s like an ephemeral sand painting experience that focuses on the cultivation presence and unlocking creative flow. Overall, Android wants to bring virtue to virtual reality and believes that it can be a tool for our own evolution. He wants to help evolve a new type of VR artist, and to create tools for the next generation of creatives and democratize the creative experience. The post Using VR for Spiritual Transformation and Unlocking Creative Flow appeared first on Road to VR.